What's going on? Did I just win? Dig through your closet for those neon socks and break out your calculator watch, the golden age of arcade games is back. 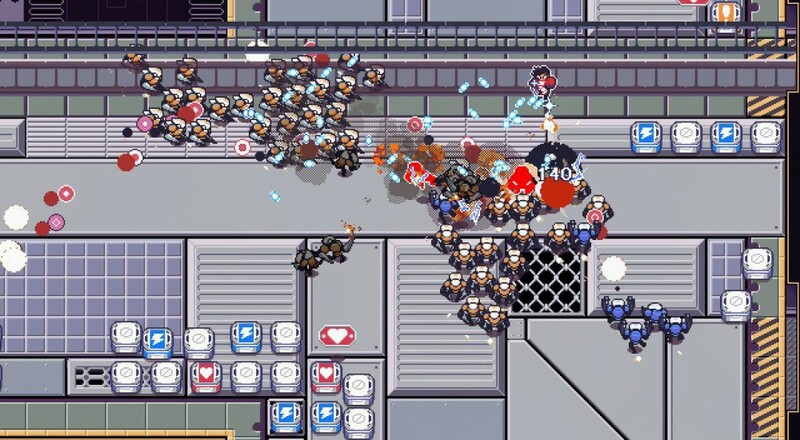 Circuit Breakers from Triverske is a classic twin stick shooter that belongs in an upright cabinet with four greasy joysticks. Or on Steam with four local players shootin' stuff all evening long, that works, too. The Galactic Federation of Affairs has hired a group of mercenaries to wipe out some bad robots. Those four mercenaries happen to have an array of shooting skills that perfectly complement each other, too. Aldo uses machine guns, Shelby uses spread shotguns, Samson's got explosives, and Tay has a tough beam rifle. Each character's weapon starts out pretty basic but upgrades through regular play. Collect energy from busted robots to level them up, but don't waste shots or get hit, 'cause that levels them down. Tough cookies, eh? Circuit Breakers plays on the classic arcade formula of shooting things until you can't shoot no more. You and up to three other local players can sit down and fire away in a series of intense, enemy-filled settings that are precisely tuned to keep you on the edge of death. Seriously, Circuit Breakers does a great job with its difficulty level, even with a full couch of co-oppers on the roster. Endless arcade and score-based modes give the action a little variety, as does a core customization feature, but other than that, it's just shooting and upgrading. Just the way we like it. Circuit Breakers is currently available on Steam. Grab a few friends, pick up a few liters of Jolt and some powdered donuts, and let the fun begin. Page created in 0.4289 seconds.